Recent work includes the Tactical Sound Garden [TSG], an open source software platform for cultivating virtual sound gardens in urban public space. It has been presented at museums, festivals and arts events internationally, including the Contemporary Museum, Baltimore, Maryland; Conflux 2006; Brooklyn, New York; ISEA 2006, San Jose, California; SIGGRAPH 2007, San Diego, California; Futuresonic, Manchester, UK; Sonar Festival, Barcelona, Spain; The Electronic Language International Festival – FILE 2007, São Paolo, Brazil; and the Arte.Mov Festival for Mobile Media, Belo Horizonte, Brazil. In 2006 he organized Architecture and Situated Technologies (with Omar Khan and Trebor Scholz), a 3-day symposium bringing together researchers and practitioners from art, architecture, technology and sociology to explore the emerging role of “situated” technologies in the design and inhabitation of the contemporary city. 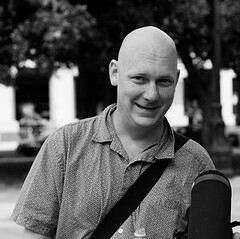 He is an editor of the Situated Technologies Pamphlet Series, published by the Architectural League of New York and co-author of “Urban Computing and its Discontents” with Adam Greenfield. Other publications include “Tactical Sound Garden [TSG] Toolkit”, in 306090 v.9 – Regarding Public Space, published by Princeton Architectural Press; “Situating the Device” and “working title: Industrian Pilz”, in Shark, a Journal of Poetics and Art Criticism, v.1 & 2; and “Extreme Informatics: Toward the De-saturated City” in Urban Informatics: The Practice and Promise of the Real-time City. media | architecture | computing MArch+MFA dual degree program. He was recently a visiting researcher with the Netlab at Studio-X, a studio for experimental design and research run by the Graduate School of Architecture, Planning and Preservation of Columbia University. Earlier this year, The Mobile City published an interview with Mark Shepard.